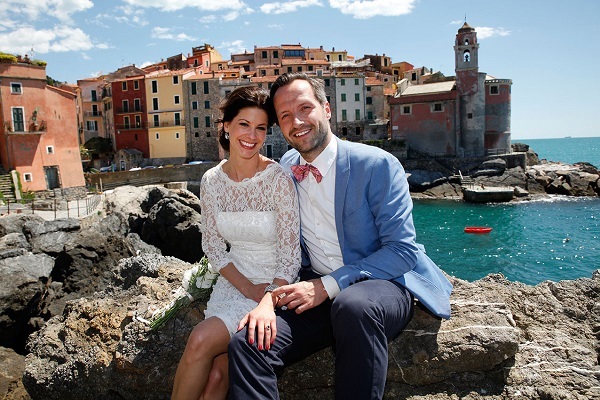 An Italian Riviera wedding in the Lerici, Gulf of Poets and San Terenzo area offers the same breathtaking beauty as the famous Cinque Terre minus the crowds. Lerici and the region of the Gulf of Poets with the small charming port towns of Tellaro and San Terenzo hold much of the same appeal as the popular Cinque Terre region. It offers Mediterranean beauty, small hidden beaches, hiking trails with a breathtaking view minus the suffocating crowds. The four towns of Lerici, San Terenzo, Fiascherino and Tellaro form the eastern edge of the Golfo dei Poeti, the Poets’ Gulf – also known as Gulf of La Spezia. The fascinating medieval castle above Lerici’s main piazza is the town’s defining feature. A beautiful small harbor and an almost two miles-long promenade invite for long walks in the summer. The Gulf of poets offers stunning views of turquoise sea and rugged shoreline, small restaurants and beautiful private villas. Lerici and the charming towns of the Gulf of La Spezia are the perfect frame for an romantic and intimate Italian Riviera wedding and unforgettable private villa weddings. Please contact us for the most charming locations and wedding venues in Lerici, Tellaro and the Gulf of La Spezia (Gulf of Poets)!